Data replication drastically improves the chances of your business surviving a regional disaster and ensuring business continuity. However, by replicating data in a globalized organization, application performance suffers and networking costs escalate. Redefining your WAN can eliminate these problems. 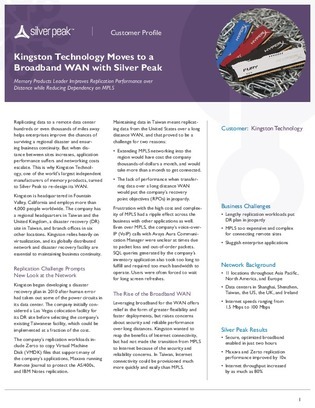 Access this white paper and see how Kingston Technology implemented a software-defined WAN to reduce costs and complexity while streamlining data replication efforts.